In this week’s study from Tehillim / Psalms 72:1-20, the psalm opens saying, א לִשְׁלֹמֹה | אֱלֹהִים מִשְׁפָּטֶיךָ לְמֶלֶךְ תֵּן וְצִדְקָתְךָ לְבֶן-מֶלֶךְ: A Psalm of Solomon. 72:1 Give the king Your judgments, O God, And Your righteousness to the king’s son. (NASB) Is David asking the Lord to judge him and to forgive his son? He continues saying, ב יָדִין עַמְּךָ בְצֶדֶק וַעֲנִיֶּיךָ בְמִשְׁפָּט: ג יִשְֹאוּ הָרִים שָׁלוֹם לָעָם וּגְבָעוֹת בִּצְדָקָה: ד יִשְׁפֹּט | עֲנִיֵּי-עָם יוֹשִׁיעַ לִבְנֵי אֶבְיוֹן וִידַכֵּא עוֹשֵׁק: 72:2 May he judge Your people with righteousness And Your afflicted with justice. 72:3 Let the mountains bring peace to the people, And the hills, in righteousness. 72:4 May he vindicate the afflicted of the people, Save the children of the needy And crush the oppressor. (NASB) What does David mean by “let the mountains bring peace to the people, and the hills in righteousness?” David asks the Lord to help the people fear him as long as the sun and moon exist (72:5), to send His blessing upon them in rain (72:6), and that righteousness would flourish until the moon is no more (72:7). It appears that David is asking the Lord to cause His blessing to fall upon his son Solomon saying, may he rule from sea to sea (72:8), that the nomads would bow before him (72:9), that the kings of the earth would bring him gifts (72:10-11), and states that his son will 72:12 “… will deliver the needy when he cries for help, The afflicted also, and him who has no helper.” (NASB) David says, יג יָחֹס עַל-דַּל וְאֶבְיוֹן וְנַפְשׁוֹת אֶבְיוֹנִים יוֹשִׁיעַ: יד מִתּוֹךְ וּמֵחָמָס יִגְאַל נַפְשָׁם וְיֵיקַר דָּמָם בְּעֵינָיו: 72:13 He will have compassion on the poor and needy, And the lives of the needy he will save. 72:14 He will rescue their life from oppression and violence, And their blood will be precious in his sight; (NASB) As a result of these things, David seems to suggest that these deeds will cause his son to obtain the gold of Sheba (72:15), the grain and abundance of the earth (72:16), and that his name would endure forever as long as the sun shines (72:17). Is David saying that by the good deeds (good works) his son performs, the Lord will bless him? How are we to understand this based upon the covenant relationship that Israel had wit hthe Lord God in heaven? How are we to understand these words based upon the covenant that we have in Yeshua the Messiah? He concludes his psalm saying, יח בָּרוּךְ | יְהֹוָה אֱלֹהִים אֱלֹהֵי יִשְֹרָאֵל עֹשֵֹה נִפְלָאוֹת לְבַדּוֹ: יט וּבָרוּךְ | שֵׁם כְּבוֹדוֹ לְעוֹלָם וְיִמָּלֵא כְבוֹדוֹ אֶת-כָּל-הָאָרֶץ אָמֵן | וְאָמֵן: כ כָּלּוּ תְפִלּוֹת דָּוִד בֶּן-יִשָׁי: 72:18 Blessed be the Lord God, the God of Israel, Who alone works wonders. 72:19 And blessed be His glorious name forever; And may the whole earth be filled with His glory. Amen, and Amen. 72:20 The prayers of David the son of Jesse are ended. (NASB) According to the last verse in the Psalm, this is the last of the prayers of David the son of Jesse. 72:13 He shall spare the poor and needy, and shall deliver the souls of the needy. 72:14 He shall redeem their souls from usury and injustice: and their name shall be precious before him. 72:15 And he shall live, and there shall be given him of the gold of Arabia: and men shall pray for him continually; and all the day shall they praise him. 72:16 There shall be an establishment on the earth on the tops of the mountains: the fruit thereof shall be exalted above Libanus, and they of the city shall flourish as grass of the earth. 72:17 Let his name be blessed for ever: his name shall endure longer than the sun: and all the tribes of the earth shall be blessed in him: all nations shall call him blessed. 72:18 Blessed is the Lord God of Israel, who alone does wonders. 72:19 And blessed is his glorious name for ever, even for ever and ever: and all the earth shall be filled with his glory. So be it, so be it. 72:20 The hymns of David the son of Jessae are ended. In this week’s study from Tehillim / Psalms 72:1-20, the psalm opens saying, א לִשְׁלֹמֹה | אֱלֹהִים מִשְׁפָּטֶיךָ לְמֶלֶךְ תֵּן וְצִדְקָתְךָ לְבֶן-מֶלֶךְ: A Psalm of Solomon. 72:1 Give the king Your judgments, O God, And Your righteousness to the king’s son. (NASB) The MT states, לִשְׁלֹמֹה (to/for Solomon), does this suggest that David wrote this psalm for his son Solomon? The title to the English translation states that this is a psalm “of” Solomon. In the Pseudepigraphic literature we find eighteen psalms of Solomon which were not included in the Septuagint. Since they were not included in the Septuagint, they were also not included in the Apocrypha. Currently these extra psalms of Solomon are found only in the Greek, no Hebrew originals have been discovered. However, there are some copies of the Septuagint and the Peshitta that do contain these 18 psalms. The 17th Pseudepigraphic psalm found within the collection of the 18 psalms is similar to Tehillim / Psalm 72 in which the titled of this psalm is attributed to Solomon. Why the English translators say this is a psalm of Solomon is not well known. The reason this is important is because of the last verse in Tehillim / Psalms 72 which states, כ כָּלּוּ תְפִלּוֹת דָּוִד בֶּן-יִשָׁי: 72:20 The prayers of David the son of Jesse are ended. (NASB) It is very important that we examine everything with a critical eye, because it is in the details that we are able to more fully understand God’s Word. (NASB) This is a powerful conclusion of the rabbis, when Israel heard God’s voice speaking from the cloud over the mountain of Sinai, the rabbis are saying that their souls fled, they died, and the Lord descended upon them in the dew of the resurrection. In the Tehillim / Psalms 68 and 69 studies, we discuss the necessity of the Lord God in heaven placing His righteousness upon His people for the purpose of His being able to dwell in their midst. The Aramaic Targum suggests the Lord raised Israel back to life when they stood before the mountain. It is by the Spirit of the Lord that imparts life, as we see here in the Targum in the concept of the Lord descending upon the people, in the dew of the resurrection, to raise them up from the dead. In Tehillim / Psalms 72:1, David very well may be asking the Lord to bring His judgments upon him, and to send His righteousness upon his son in his mercy (grace). The reason being, we know that for the children of God, the Lord brings judgment coupled with His mercies, whereas for the wicked, there is no mercy, there is only judgment. David knows the Lord is merciful, long suffering, and forgiving to the thousandth generation. David continues in His psalm saying, ב יָדִין עַמְּךָ בְצֶדֶק וַעֲנִיֶּיךָ בְמִשְׁפָּט: ג יִשְֹאוּ הָרִים שָׁלוֹם לָעָם וּגְבָעוֹת בִּצְדָקָה: ד יִשְׁפֹּט | עֲנִיֵּי-עָם יוֹשִׁיעַ לִבְנֵי אֶבְיוֹן וִידַכֵּא עוֹשֵׁק: 72:2 May he judge Your people with righteousness And Your afflicted with justice. 72:3 Let the mountains bring peace to the people, And the hills, in righteousness. 72:4 May he vindicate the afflicted of the people, Save the children of the needy And crush the oppressor. (NASB) He moves on from asking the Lord to forgive his son, to the people, to judge His people with righteousness. Note how the MT is written saying, יָדִין עַמְּךָ בְצֶדֶק using the word דִין to describe the legal ruling, and that the legal ruling is coupled to God’s righteousness (בְצֶדֶק). In addition to this, David says, וַעֲנִיֶּיךָ בְמִשְׁפָּט meaning “And Your afflicted, in justice,” which reminds us of Parashat Shoftim (Devarim / Deuteronomy 16:18-21:9) where Moshe writes on the establishment of offices of administration, judges, and officers and the necessity for justice saying יח שֹׁפְטִים וְשֹׁטְרִים תִּתֶּן-לְךָ בְּכָל-שְׁעָרֶיךָ אֲשֶׁר יְהוָֹה אֱלֹהֶיךָ נֹתֵן לְךָ לִשְׁבָטֶיךָ וְשָׁפְטוּ אֶת-הָעָם מִשְׁפַּט-צֶדֶק: יט לֹא-תַטֶּה מִשְׁפָּט לֹא תַכִּיר פָּנִים וְלֹא-תִקַּח שֹׁחַד כִּי הַשֹּׁחַד יְעַוֵּר עֵינֵי חֲכָמִים וִיסַלֵּף דִּבְרֵי צַדִּיקִם: כ צֶדֶק צֶדֶק תִּרְדֹּף לְמַעַן תִּחְיֶה וְיָרַשְׁתָּ אֶת-הָאָרֶץ אֲשֶׁר-יְהוָֹה אֱלֹהֶיךָ נֹתֵן לָךְ: 16:18 ‘You shall appoint for yourself judges and officers in all your towns which the Lord your God is giving you, according to your tribes, and they shall judge the people with righteous judgment. 16:19 ‘You shall not distort justice; you shall not be partial, and you shall not take a bribe, for a bribe blinds the eyes of the wise and perverts the words of the righteous. 16:20 ‘Justice, and only justice, you shall pursue, that you may live and possess the land which the Lord your God is giving you. (NASB) The Hebrew text according to the Torah is written saying, “to judge with justice is to judge righteously” (מִשְׁפַּט-צֶדֶק). Here again the word for “judgment, justice, or ordinance” is coupled with the word righteous (צֶדֶק). David very well may be thinking upon this Torah portion when writing his psalm, that in righteousness the Lord will cause the legal ruling of guilt to be tempered by His mercy, and to have justice for the afflicted, which from a Torah perspective, again draws in the righteousness, mercy, and grace of God. Notice the way the Scriptures are written in Devarim / Deuteronomy 33:15, which speaks of the best choice things of the ancient mountains and hills. The Scripture then continues speaking of the choice things of the earth (33:16), of the cattle that dwell upon the mountains and in the valleys (33:17), and how the people go to the mountains to offer righteous sacrifices (33:19). Within the context of these things, the mountains offer a place of security for the people found within the covenant relationship with the Lord. The mountains invoke a blessing upon the people in the way the Lord blesses the flocks (cattle), provides a place of protection and safety from one’s enemies, and all of these things coupled together bring peace in the knowledge that God is in control. Mountains also provide protection in the sense that they are difficult to cross for imposing military and armies who might come to attack. Note also that this place, the Promised Land, is a region that requires the blessing of the Lord to bring rains in their seasons, and to cause the Land to produce what is needed to sustain the people. This portion of the Torah may have been what David was thinking of when he wrote asking the Lord to help the people fear him as long as the sun and moon exist (72:5), to send His blessing upon them in rain (72:6), and that righteousness would flourish until the moon is no more (72:7). It appears that David is asking the Lord to cause His blessing to fall from heaven upon his son Solomon saying, may he rule from sea to sea (72:8), that the nomads would bow before him (72:9), that the kings of the earth would bring him gifts (72:10-11). The blessings of the Lord falling upon God’s people would come by the way of placing the fear of God in one’s heart and the nations coming to bless Israel was well. The rabbis say David is speaking of the inhabitants of the mountains being lifted up in peace for the house of David. Who are the inhabitants of the mountains? Is this a reference to Edom? (Bereshit / Genesis 36:8 So Esau lived in the hill country of Seir; Esau is Edom. NASB) David may be asking for peace from his enemies. This interpretation is based upon the words in Tehillim / Psalms 72:4 which have David asking for the Lord to judge the poor and to redeem the sons of the lowly for the purpose of purging away the oppressor (the enemy). The way the Aramaic Targum describes the psalm, the people fearing the Lord and praying in His presence for all generations (72:5), the Lord descending like rain on the grass (note rain brings in the Torah context of the covenant blessings), and the locust being the enemy, and how righteousness and peace will increase, until the ones who worship the moon are destroyed. Note the connections being made to the nomadic peoples who worship the moon. Another example may be taken from Easter which became the Christianized time for the celebration of Christ’s death and resurrection. Historically, early missionaries hoped to convert the pagan celebrants to Christianity. They chose to spread their message of faith throughout the populations by taking many of the traditions of the Christian observance of the Resurrection of Yeshua, which occurred at roughly the same time of year in the celebration of Passover, and folding it into the pagan feast of Eostre. The timing of Easter Sunday illustrates its roots, being based upon the cycle of the Sun and the Moon and by its falling upon the first Sunday after the first full moon following March 21. Thus, Easter may fall on any date between March 22 to April 25. Note David’s words asking the Lord to destroy those who worship the sun and the moon. How important do you think it is to remove the ways of the nations from out worship of the Lord God in heaven and Yeshua the Messiah? David continues saying his son, יב כִּי-יַצִּיל אֶבְיוֹן מְשַׁוֵּעַ וְעָנִי וְאֵין-עֹזֵר לוֹ: 72:12 “… will deliver the needy when he cries for help, The afflicted also, and him who has no helper.” (NASB) Note how David is describing his son, the one who helps when one cries out for help, and the afflicted also, and to the one who has no helper. This appears to be a description of the ideal king, the one who listens, hears the plea of the people and is devoted to both the people and to God. In Judaism, the name or title of the ideal king is the one who comes in the time of the Messianic age known as “Mashiach” (in the Babylonian Talmud and in the midrash literature). In the Tanach, the earliest use of the word Mashiach is with YHVH (or with a pronominal suffix referring to the Lord God in heaven). Its usage in the Tanach is as a title of the ruling sovereign Messiah YHVH (“God’s anointed one”) according to 1 Samuel 2:10, 2:35, 12:3-5, 16:6, 26:9-23, 2 Samuel 1:14-16, 19:21, 2 Chronicles 6:42, Tehillim / Psalms 18:51, 20:7, 132:17, and Lamentations 4:20. In post-exilic times, the high priest, filled the place formerly occupied by the king, and is spoken of as “ha-Kohen ha-Mashiacḥ” (the anointed priest, see Vayikra / Leviticus 4:3, 4:5, 4:16, and 6:5). Also in Daniel 9:25-26, it is written as “Mashiach Nagid” (an anointed one, a ruler) and/or simply “Mashiach” (an anointed one). In the rabbinic apocalyptic literature the conception of an earthly Messiah is the prevailing one. We find many references to the King Messiah in the Aramaic Targum and in the Midrashim. The significance of the Messiah in Judaism is found in Judaism’s central prayer, the Amidah which is often designated simply as tefila (תפילה, “prayer”) in Rabbinic literature. Tefila is also known as the Amidah (תפילת העמידה, Tefilat HaAmidah, “The Standing Prayer”), and also called the Shmoneh Esreh (שמנה עשרה, “The Eighteen,” in reference to the original number of constituent blessings, the number of which is now nineteen). We read the following in the fifteenth benediction on the coming of the Messiah. And look forward to deliverance. Blessed art Thou, Lord, who makes the glory of deliverance to flourish. The truth of the matter is, according to the Amidah, all Orthodox Jews believe that God will send the Messiah to redeem Israel, and seek the Lord God in prayer three times a day for the coming of the Messiah. So important is the Messiah to Judaism that the great sage Maimonides numbered it among the Thirteen Principles of Faith (http://www.chabad.org/library/article_cdo/aid/332555/jewish/Maimonides-13-Principles-of-Faith.htm). In the second benediction, we interestingly find the word “deliverance” written as “Yeshua” (ישועה), which provides an interesting insight into the angel’s injunction to Miryam and Joseph saying, “You shall call his name Yeshua, for it is he who shall save his people from their sins” (Mat. 1:21): Every day, three times a day, pious Jewish men like Joseph gathered in the synagogues and prayed for the Holy One to send Yeshuah, Salvation. In the fifteenth benediction, the line that states, “And look forward to deliverance,” is said with the fulfillment of “the Talmudic teaching that a Jew must look forward to redemption every day” (see the Artscroll Siddur) and the subsequent commentary that states, “Here we are taught that the ultimate salvation of the Jewish people is possible only through the Davidic Messiah.” With these things in mind, it is questionable why modern Jewish commentators write that the main focus of Judaism is not concerning the Messiah, as we read in the Torah portion from Aish.com titled, “Balak (Numbers 22:2-25:9) Do We Want Mashiach Now?” (http://www.aish.com/tp/i/m/48923592.html). The commentators are in unanimous agreement with Maimonedes regarding the meaning of this prophecy; they all interpret this passage as a reference to the Mashiach. But the fact that his coming was the subject of a prophesy (referring to Bamidbar / Numbers 24:17-24) doesn’t automatically elevate the belief in the coming of Mashiach into a basic axiom of Jewish faith. Why does Maimonedes consider this belief so fundamental to Judaism? In addition to this, we are told in Vayikra / Leviticus 26:1-46 You shall not make idols for yourselves or erect an image or pillar, and you shall not set up a figured stone in your land to bow down to it, for I am the Lord your God. You shall keep my Sabbaths and reverence my sanctuary: I am the Lord. If you walk in my statutes and observe my commandments and do them, then I will give you your rains in their season, and the land shall yield its increase, and the trees of the field shall yield their fruit. Your threshing shall last to the time of the grape harvest, and the grape harvest shall last to the time for sowing. And you shall eat your bread to the full and dwell in your land securely. (ESV) This suggests also that obedience to the command will cause the Lord’s blessing to fall upon the land, whereas the disobedience to the commands (living in sin) will result in oppression, the enemy coming, and even the one who sins will flee when there is nobody chasing him. (see Parshiot Behar and Bechukotai). As a result of these things, David seems to suggest that these deeds will cause his son to obtain the gold of Sheba (72:15), the grain and abundance of the earth (72:16), and that his name would endure forever as long as the sun shines (72:17). Is David saying that by the good deeds (good works, maasim tovim) his son performs, the Lord will bless him? It is interesting how the Aramaic Targum describes this person David is speaking of saying, 72:17 May his name be invoked for ever; and before the sun came to be his name was determined; so all the peoples will be blessed by his merit, and they shall speak well of him. (EMC) Somehow the name of this king, the son, was determined even before the creation. The way the Aramaic Targum is written it sounds a lot like Yeshua the Messiah, by his merit we are saved, he cares for us, and his name is invoked for ever (לְעוֹלָם). How does God view “merits?” In the sense of this Psalm, obeying God’s word merits a good life and the Lord raining down his blessing upon us. On the other hand, disobeying God’s word merits bad things happening. The idea of one meriting blessing, is a way in which the Scriptures work to encourage us in our walk before the Lord. As we live for Him, we are essentially drawing near to Him and He consequentially draws near to us. The important point is to realize, if we are willing, that there is a connection to Torah observance and our devotion to Messiah, and that these two things go hand in hand. These two things are also absolutely necessary to fulfill and complete the redemptive plan of God in our lives and for all of Israel, in and through Israel, and to the entire world. Note that the merit of Torah observance can also be metaphorically understand in the context of the merit of Gentiles in the sense that Torah study and observance has the effect of being a part of the Messianic plan to draw all of Israel back to the Torah, to the Land, and to the Lord God in heaven. This is not by our own doing, this comes by the hand of the Lord that is upon our lives, and His living and working in our lives. This is how we are to understand the relationship between the covenant we have in Yeshua the Messiah and the Torah. This is also how we understand these words of the Psalm based upon the covenant that we have in Yeshua the Messiah. The context of Luke chapter 1 speaks of the birth of John Ha’Matbil (the Baptist), when Zechariah’s lips were loosed and he was able to speak, he gave praise to the Lord God in heaven and describes how this child will be a horn raised up for the salvation of Israel, how he will lead the people, and rescue the people from the hand of the enemy. We find a very similar context to David’s description in Tehillim / Psalms 72, and coupled with the Aramaic Targum, and the rabbis commentary on the psalm, this may be the reason the Gospel of Luke records in Luke 1:68 as the Lord’s blessing his people Israel and accomplishing His redemption for His people in the King Messiah Yeshua. John prepared the way for Yeshua, preaching Teshuvah (repentance), and to turn our lives to the Lord God in heaven, to seek His righteousness in our lives, to seek His help, and to live for His glory. The King Messiah is the one who guides and directs us for that very same purpose! Let’s Pray! 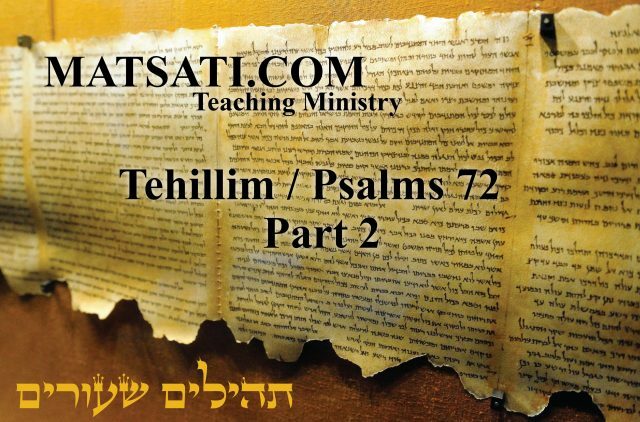 The Rabbinic Commentary (Midrash) on Tehillim / Psalms 72 has 6 parts. Reading through the Midrash we will be looking at Part 1, 2, 4, 5, and 6. Let’s begin by outlining Midrash Tehillim Chapter 72, Parts 1, 2, 4, 5, and 6. The משל (mashal) “the parable,” goes on to explain the פתיחתא (Petihta), the rabbis comment upon David’s words speaking about merit and righteousness. The נמשל (Nimshal) “expansion on the parable” expands upon the משל (mashal), the rabbis expand upon the mashal giving examples on what the Lord does with our merit and His righteousness. The משל (mashal) “the parable,” goes on to explain the פתיחתא (Petihta), the rabbis comment upon David’s words and appear to be following on from the previous midrash on righteousness and merits. The נמשל (Nimshal) “expansion on the parable” expands upon the משל (mashal), the rabbis expand upon the mashal with biblical examples on the judgments of God from the Scriptures. The משל (mashal) “the parable,” goes on to explain the פתיחתא (Petihta), the rabbis comment upon David’s words to describe the Messiah who will be good to the poor and weak, and bring the judgment of God to the wicked and unrighteous. The נמשל (Nimshal) “expansion on the parable” expands upon the משל (mashal), the rabbis expand upon the mashal with examples. The משל (mashal) “the parable,” goes on to explain the פתיחתא (Petihta), the rabbis comment upon David’s words upon the meaning of the rain and the shearing. The נמשל (Nimshal) “expansion on the parable” expands upon the משל (mashal), the rabbis expand upon the mashal discussing the sun, the moon, the righteous, and the world to come. The משל (mashal) “the parable,” goes on to explain the פתיחתא (Petihta), the rabbis comment upon David’s words and again speak of the King Messiah. The נמשל (Nimshal) “expansion on the parable” expands upon the משל (mashal), the rabbis expand upon the mashal and seem to make a distinction between Solomon, David’s son, and the King Messiah. He asks the question about who may be called righteous and states that the Lord God in heaven loves righteousness. Rabbi Judah quotes from Tehillim / Psalms 2:7, and comparing the midrash on Tehillim / Psalms 2, Midrash Tehillim 2, Part 9, the rabbis understand the psalm of David to be Messianic. Rabbi Judah may be drawing in a perspective here on the Psalm with regard to righteousness of man as opposed to the righteousness of God in his question of who may be called righteous. In the midrash on Tehillim / Psalms 2, we read, the דיבור המתחיל (Dibur Hamathil) and the פתיחתא (Petihta) states ז אֲסַפְּרָה אֶל חֹק יְהוָה אָמַר אֵלַי בְּנִי אַתָּה אֲנִי הַיּוֹם יְלִדְתִּיךָ: 2:7 ‘I will surely tell of the decree of the Lord: He said to Me, ‘You are My Son, Today I have begotten You. (NASB) The משל (mashal) “the parable” states that the Children of Israel are the sons of God according to the decree of the Torah, the Neviim (Prophets), and Ketuvim (Writings) citing the Scripture from Shemot / Exodus כב וְאָמַרְתָּ אֶל-פַּרְעֹה כֹּה אָמַר יְהֹוָה בְּנִי בְכֹרִי יִשְֹרָאֵל: 4:22 ‘Then you shall say to Pharaoh, ‘Thus says the Lord, ‘Israel is My son, My firstborn. (NASB) The sons of God, the Children of Israel are said to be exalted and lifted up, they will prosper (Isaiah 52:13, יג הִנֵּה יַשְֹכִּיל עַבְדִּי יָרוּם וְנִשָּׂא וְגָבַהּ מְאֹד) that this will occur to the servant in whom is God’s delight (Isaiah 42:1, א הֵן עַבְדִּי אֶתְמָךְ-בּוֹ בְּחִירִי רָצְתָה נַפְשִׁי נָתַתִּי רוּחִי עָלָיו מִשְׁפָּט לַגּוֹיִם יוֹצִיא). The concepts Rabbi Judah may be drawing into the midrash on Tehillim / Psalms 2 is of righteousness, God’s people are called to live righteous lives according to the Torah of the Lord. The rabbis then lead into a discussion of the vision of Daniel in Midrash Tehillim 2, Part 9, Daniel 7:13-14, יג חָזֵה הֲוֵית בְּחֶזְוֵי לֵילְיָא וַאֲרוּ עִם-עֲנָנֵי שְׁמַיָּא כְּבַר אֱנָשׁ אָתֵה הֲוָא וְעַד-עַתִּיק יוֹמַיָּא מְטָה וּקְדָמוֹהִי הַקְרְבוּהִי: יד וְלֵהּ יְהִיב שָׁלְטָן וִיקָר וּמַלְכוּ וְכֹל עַמְמַיָּא אֻמַיָּא וְלִשָּׁנַיָּא לֵהּ יִפְלְחוּן שָׁלְטָנֵהּ שָׁלְטָן עָלַם דִּי-לָא יֶעְדֵּה וּמַלְכוּתֵהּ דִּי-לָא תִתְחַבַּל: 7:13 ‘I kept looking in the night visions, And behold, with the clouds of heaven One like a Son of Man was coming, And He came up to the Ancient of Days And was presented before Him. 7:14 ‘And to Him was given dominion, Glory and a kingdom, That all the peoples, nations and men of every language Might serve Him. His dominion is an everlasting dominion Which will not pass away; And His kingdom is one Which will not be destroyed. (NASB) The vision of Daniel is very Messianic and speaks of the “One like the Son of Man” who will have dominion and power over all of the earth. This is interesting because the Midrash on Tehillim 72 directs us to the midrash on Tehillim 2 and to Daniel’s vision and the One who the Lord God establishes upon His Holy Mountain, the Messiah. Rabbi Judah interprets these things to say that God rewards us for merit and good works. And if one does not have merit and good works, that the Lord God bestows His righteousness upon us. The righteousness of God is given to the people when there is need for such. In a different interpretation, the verse is read, Say no more of the righteous than that he is good. Rabbi Aibu taught, You find it said of the Holy One blessed be He, while He was creating His world, that after each day’s work God saw that it was good. But note that it was only after He came to the end of His work and ceased that Scripture says, God saw everything that He had made and behold, it was very good (Bereshit / Genesis 1:31). Rabbi Jose taught in the name of rabbi Hanina, When the Holy One blessed be He, sought to send Moshe to Egypt, what did Moshe ask? He asked, Behold, when the children of Israel ask me, What is His name? What will I say unto them? (Shemot / Exodus 3:13). The Holy One blessed be He, replied, you know not My name. Come, and I will tell you, I am that I am; and He said, Thus will you say unto the children of Israel, I am has sent me unto you (Shemot / Exodus 3:14). You find I am written three times, and this means that the Holy One blessed be He, said, I created My world with compassion, I will guide it with compassion, and I will return to Jerusalem with compassion, as is said, I return to Jerusalem with compassion (Zechariah 1:16). The midrash draws in the creation account and the Lord looking upon the work of his hand and says that it was only after each days work that He saw that it was good. It is important to recognize that the Lord is in the process of doing a good work in our lives. This rabbinic commentary reminds us of what the Apostle Paul wrote to the Philippians regarding the Lord working in our lives, he says in Philippians 1:6 For I am confident of this very thing, that He who began a good work in you will perfect it until the day of Christ Jesus. (NASB) This may be the reason why the Lord places His righteousness upon us; He is planting the seeds for growth and to work a good work in our lives for righteousness sake. The midrash continues with the account of the creation and the Lord sending Moshe to Egypt to deliver the people. Moshe asks the name of the Lord and the way the name is written it refers to three things, (i) the Lord created the world with compassion, (ii) the Lord will guide the world with compassion, and (iii) the Lord will return to Jerusalem with compassion. (אמר הקב״ה ברחמים בראתי את עולמי, וברחמים אני עתיד לנהגו, וברחמים אני עתיד לחזור לירושלים, שנאמר שבתי לירושלים ברחמים (זכריה א יו)) The Midrash states ברחמים “in mercies” the Lord will do these things, and that is consistent with His having given His people His righteousness, He has placed His righteousness upon His people. Midrash Tehillim 72, Part 1 concludes saying, “After Moshe went and spoke to the children of Israel, they said to him, What are we obligated to say of the Righteous One of the universe? That He is good. Hence, you say of the Righteous that He is good. And David also said, O give thanks unto the Lord; for He is good; for His mercy endures forever (Tehillim / Psalms 106:1).” The Lord is good and unique because He gives His righteousness to those who seek it. We are told the reason that we are to proclaim “the Lord is good” is because of His righteousness and His mercies. Isaiah says that Jerusalem has rebelled against the presence of the Lord. Their faces bear witness against them. What does it mean that their faces bear witness against them? This may be a reference to their lustful expressions, Isaiah says they display their sin like Sodom and do not conceal it meaning that the people have no shame in their sins. In their sins, they have brought evil upon themselves. Do you think that God functions in this same way today? Does evil come upon a person because of his sins? What about those who believe and trust in Yeshua the Messiah? Are there any circumstances in which this is not the case? Isaiah continues saying the leaders guide and lead the people astray from the path of God and confuse the people’s direction. Because of this the Lord stands in judgment of the leaders; note how the prophet Isaiah states that they devoured vineyards and plunder the poor. The vineyard reference sounds like Ahab and Jezebel and Naboth’s vineyard (1 Kings 21). A good man is one who loves peace. Rabbi Hillel taught on the importance of peace by saying, “Be of the disciples of Aaron, a lover of peace and a pursuer of peace, one who loves mankind and draws them nearer to the Torah.” According to Rabban Simeon ben Gamaliel, peace is one of the three pillars that sustain civilization, the other two being justice and truth. (Mishnah Pirkei Avot 1:18). Peace is the condition for the enjoyment of all other blessings. There may be food, there may be drink, but “if there is no peace there is nothing.” As a result, the rabbis advised people to shun quarreling. The one who is able to exercise restraint “will escape a hundred evils.” In addition, the quarrelsome person who readily gives vent to his anger “will destroy his home.” (Midrash Bamidbar Rabbah 11:7, Talmud Bavli Sanhedrin 7a, 102b) It is important to seek peace and to do good to one another. The midrash states that David left the fruit of his doings. The phrase “fruit of his doings” appears to be a reference to one’s sins. The idea is that David gave justice and righteousness to the people, he did not oppress the people. This is the way in which the rabbis interpret the Psalm of David saying in a similar manner, David asked the Lord God to give His righteousness to his son Solomon. The purpose was for being able to judge the people in righteousness. Based upon the midrash, the righteousness of God enables one to discern between right and wrong, and even of the intent of the heart. This sounds like what is called “the discerning of the spirit.” The righteousness of God appears to be what is known as “the spiritual gift of discerning spirits” based upon the midrashic description. According to the Apostolic Writings, the gift of discerning or “distinguishing” spirits, is one of the gifts of the Holy Spirit described in 1 Corinthians 12:4-11. Based upon the Apostolic Writings, each person who has been given the gift of the righteousness of God has been given a certain amount of discernment. Hebrews 5:13-14 tells us that the person who has matured beyond the use of “the milk of the Word” is able to discern both good and evil. Maturity is empowered by the Spirit of God, and the person who chooses to focus upon the Word of God will be given the ability to be spiritually discerning in a greater way. This discernment is meant for distinguishing between the truth of the Scriptures and erroneous and deceptive doctrines propagated by evil spirits. (1 Timothy 4:1) In the Apostolic Writings, we are all exhorted to be spiritually discerning (Acts 17:11 and 1 John 4:1). The idea is that the spiritually discerning person is so familiar with the Word of God that they instantly recognize what is contrary to what the Lord God in heaven wants. This isn’t necessarily something that is like a “special message from God,” but the use of the Word of God to test everything to see whether things line up with God’s will as opposed to those things that do not. (2 Timothy 2:15) The Apostle Paul spoke of being equipped and ready, and that success is dependent upon our being willing to be used of the Lord, seeking Him, and to be actively turning from sin on a daily basis. Success is based upon faithfully seeking the Lord, loving one another, and seeking to do what is right and just and true. These are the things king Solomon did when he sat in judgment between the two women and the one dead son. The rabbis try to argue over who the women were, demons who simulated women, harlots, sisters in law whose husbands died, etc. King Solomon discerned that the one who was the true mother of the child would love and care for the child and give the child away rather than to see harm come to the boy. Midrash Tehillim 72, Part 2 concludes saying, “Rabbi Eleazar taught, The Holy One blessed be He, showed Himself in three courts of justice, in the court of Shem, son of Noah; in the court of Samuel the Ramathite; and in the court of Solomon. With regard to God’s showing Himself in the court of Shem, it is said, And Judah acknowledged them, and said, She speaks the truth. She is with child because of me (Bereshit / Genesis 38:26). How did Judah know? If he had gone in to her, another man might have gone in to her. But it was a heavenly voice that came forth and said, Because of Me, that is, it was My will that these deeds be kept secret. With regard to God’s showing Himself in the court of Samuel in the part of Scripture where And he said, The Lord is a witness (1 Samuel 12:5) occurs, does not the context require that it be written And they said, etc? The words and he said imply, however, that it was a heavenly voice that came forth and said, I am a witness for Samuel. And with regard to God’s showing Himself in the court of Solomon, it is said, Give her the living child, and in no wise slay it. She is the mother thereof (1 Kings 3:27). How did Solomon know? Perhaps the woman had spoken craftily, so that Solomon would award the child to her? But it was a heavenly voice that came forth and said, She is the mother thereof.” The rabbis provide proof texts from the Tanach on the Lord’s wisdom being given to the men of Israel. It is interesting how the interpretation follows with a voice from heaven declaring the one who was guilty or innocent. Even in Solomon’s case, we read in the midrash, “Thereupon a heavenly voice came forth, and said, She is the mother.” Even though the Lord provides men with His righteousness, and giving them the ability to discern between right and wrong, the Lord God Himself needs to intervene in order to ensure that the judgment is made correctly. The midrash speaks of the Lord God in heaven moves to work righteousness, justice, and truth in the lives of His people. But we also are to be willing to allow the Lord God to work in our lives by the power of His Spirit too. Midrash Tehillim 72, Part 4 opens with the Dibur Hamathil (דיבור המתחיל) saying “In further comment on He will judge Your people with righteousness, they will fear You while the sun endures (Tehillim / Psalms 72:2-5).” The homiletic introduction to the midrash states, “Rabbi Jose son of Halafta said, A man is judged every morning, for it is said, You visit him in the mornings (Job 7:18).” It could be the idea that one is judged every morning is by reason that the Lord gives a man life in the morning to continue living because He is merciful. The concept here is that the spirit of a man departs at night, and then returns in the morning. Why do the rabbis say the Lord visits man in the mornings? This is an important concept regarding the Lord visiting in the mornings. In John 3:2 we read “this man came to Jesus by night and said to Him, “Rabbi, we know that You have come from God as a teacher; for no one can do these signs that You do unless God is with him.” (NASB) John 3:2 states, οὗτος ἦλθε πρὸς αὐτὸν, we find the pronoun “him” (αὐτὸν) in the Greek instead of the name Yeshua. Based upon the context from the previous chapter, Nicodemus may have been dissatisfied with the way in which his colleagues were dealing with Yeshua and resolved to judge for himself. Nicodemus obviously wanted to see for himself whether Yeshua was the Messiah, and he did so by the cover of darkness. According to John 7:50 and John 19:39, Nicodemus appears to identify with the Messiah in a more public manner as opposed to his encounter in John 3:2. The point is how Nicodemus came to Yeshua at night. He was trying to conceal his actions. In the midrash, the Lord God in heaven comes at day light because He is not concealing His actions. His actions are being made known publicly. What we find is the one who judges the poor and the people, the one who saves the needy, and breaks the hold of the oppressor, this is the Messiah of God. The rabbis opinion on the actions of the Messiah are to do these things, to come with the righteousness of God and having been given the ability to judge by the power of God and by His righteousness. Note how the rabbis connect the Messiah to the one who comes to destroy the wicked (Isaiah 11:4). Note also how the midrash uses the word שמש as a reference to the sun. The word shemesh may also be a play on the word shamash (שמש) as a reference to the righteous servant, and the light of the sun parallels the light of righteousness, and darkness to unrighteousness. The midrash states that they will fear the Messiah as long as the sun (the righteous one) is upon them, “that is, fear him in this world in which the light of the sun is required; and will fear him as long as the moon is before them, that is, fear him for as long as the moon looks down upon them before its light is finally confounded.” The concepts here may be that during the day, the light of the sun is a reference to the righteousness of God which the Messiah brings as judgment upon the wicked. The light of the moon suggests that even during night time, there is light, the righteousness of God does not cease during the night time, and God’s judgment is complete, the wicked (unrighteous) can not escape the Lord’s Messiah (deliverer, savior, etc). The midrash continues saying, “For there will come a time of which it is said, Then the moon will be confounded and the sun ashamed, when the Lord of hosts will reign in Mount Zion and in Jerusalem (Isaiah 24:23).” This suggests a similar theme to what Yeshua describes as his returning. As we read in Matthew 24:29 ‘But immediately after the tribulation of those days the sun will be darkened, and the moon will not give its light, and the stars will fall from the sky, and the powers of the heavens will be shaken. 24:30 And then the sign of the Son of Man will appear in the sky, and then all the tribes of the earth will mourn, and they will see the Son of Man coming on the clouds of the sky with power and great glory. 24:31 ‘And He will send forth His angels with a great trumpet and they will gather together His elect from the four winds, from one end of the sky to the other. (NASB) Yeshua describes the distress of those days and at this time He will return to save His people. The midrash follows saying that at that time the sun will no longer be a light, and neither will the moon, but the Lord will be an everlasting light (Isaiah 60:19). These concepts sound very similar to what we read at the end of the book of Revelation. Based upon these Scriptures, the Messiah will hand the power He was given back to the Lord God in heaven. This may be the reasoning behind the idea in Judaism that the Messiah is not about bringing a person to the world to come. In the Olam Haba, the Messiah will hand all power and authority back to the Father in heaven, and be subjected to Him. According to the book of Revelation, the Lamb (the Messiah) has an integral role in the Olam Haba, in the sense that the Lamb will continue to lead the people in the way of the Lord, in the light of His righteousness and truth. Midrash Tehillim 72, Part 4 concludes saying, “And how are we to interpret until the generation of generations? It is the immortal generation which is not to be followed by another generation. Another comment, the words They will fear You as long as the sun is upon them allude to the morning prayer, for the Shema must be read at sunrise; the words and the moon is before them allude to the afternoon prayer which must be said before it gets dark and the world needs the light of the moon. Our Masters read The will fear You, etc., as They will fear You as the light of the sun withers and therefore take these words to apply to the prayer said at dusk.” Note how the rabbis speak of an immortal generation that is not followed by another generation. This does seem to have parallels to the account in the Apostolic Writings of Yeshua, the resurrection, the children of God, the Olam Haba, etc. In the conclusion of the midrash, the rabbis appear to answer the reason why the Lord comes in the morning to a man. The reason is by the morning prayers and the Shema being read at sunrise. The moon is a reference to the afternoon prayer. The world needs both the greater and lesser light, where the light is a reference to God’s righteousness, may suggest that the world needs the Righteousness of the Lord God our Father in heaven, and the Righteousness of His Messiah Yeshua, because Yeshua comes bringing with Him the Righteousness of God whereupon he gives unto His people for the forgiveness of sins, for deliverance, and for salvation from this present world. ה ירד כמטר על גז. מהו על גז, אם תאמר על גז ממש, מאי אהניא ליה, אלא כהדא מיטרא על עישבא גזזא. כרביבים זרזיף ארץ. מהו זרזיף, שמזרז ומייפה הארץ. יפרח בימיו צדיק. הדא הוא דכתיב צדיק כתמר יפרח כארז בלבנון ישגה שתולים בבית ה׳ בחצרות (בית) אלהינו יפריחו (תהלים צב יג יד). ורוב שלום עד בלי ירח. עד היכן, עד זמן שיתכלה הירח. כשם שהשמש והירח מאירין בעולם הזה, כך הצדיקים עתידין להאיר לעולם הבא, שנאמר והלכו גוים לאורך ומלכים לנוגה זרחך (ישעיה ס ג). וירד מים עד ים. כל זה השבח למלך המשיח, וכל זה למה, בשביל משפטי צדק, שנאמר כי יציל אביון משוע ועני ואין עוזר לו. 5. He will come down like rain upon the shearing (Tehillim / Psalms 72:6). How are we to interpret the phrase, upon the shearing? If you say that the phrase refers to shorn fleece, what good would rain do it? Therefore, the phrase must refer to rain upon the shorn field. As showers that water (zarzif) the earth, what does zarzif connote? Waters that awaken (zarez) and beautify (yafeh) the earth. In his days will the righteous flourish (Tehillim / Psalms 72:7). Elsewhere, another Psalm says, the righteous will flourish like the palmtree; he will grow like a cedar in Lebanon. Those that be planted in the house of the Lord, will flourish in the courts of our God (Tehillim / Psalms 92:12-14). The verse concludes And abundance of peace, till there be no moon (Tehillim / Psalms 72:7). Till when? Till the moon comes to an end. Even as the sun and the moon give light in this world, so the righteous will give light in the world to come, as is said, And the nations will walk at your light, and kings at the brightness of your rising (Isaiah 60:3). He will have dominion also from sea to sea (Tehillim / Psalms 72:8). All this glory of dominion will be the king Messiah’s. And why all this? Because of righteous judgments, for it is said of him He will deliver the needy when he cries; the poor also, and him that has no helper (Tehillim / Psalms 72:12). Note how the sun and the moon are mentioned again with a reference to the world to come (כך הצדיקים עתידין להאיר לעולם הבא, שנאמר והלכו גוים לאורך ומלכים לנוגה זרחך). The glory of God, the glory of the dominion of the King Messiah (למלך המשיח), and the salvation of the people in this present age are all drawn into context to the world to come (לעולם הבא). What we are seeing here in the midrash is the importance of the Messiah of God who is made King having an everlasting dominion. The Messiah is being given a preeminence or predominant position as the one who has with Him the glory of God, His righteousness, and truth and judgment. This is similar to what we read in Hebrews 2:5-18 speaking of Yeshua the Messiah. The author of Hebrews contrasts the Messiah with the ministering angels and then proceeds to describe the supremacy of the Son into direct relation to the Messianic administration of “the world to come.” Is this not the same thing that is being taught according to Midrash Tehillim 72, Part 4 and 5? The ideal condition of man is to be ruled by the King Messiah, which is explained by reason of the purpose of His rule and reign, to be the one who judges the poor and the people, the one who brings justice to all, the one who saves the needy, and breaks the hold of the oppressor, who brings with Him the Righteousness of God to judge both the righteous and the unrighteous, and who also brings with Him the wrath of God to those who do not know Him and do not want to have a part with Him. This is the rabbinic description of the Messiah of God, and it appears to also be the kind of description that is taken from the disciples, Paul, and all of the Apostolic Writings. Midrash Tehillim 72, Part 5 concludes saying, “Because of righteous judgments, for it is said of him He will deliver the needy when he cries; the poor also, and him that has no helper (Tehillim / Psalms 72:12).” The conclusion is the Kin Messiah will do what is right because he is coming according to the will of the Most High God, our Father in heaven. ו יהי פסת בר בארץ. ר׳ חייא בר אסי בשם ר׳ יוחנן אמר עתידה ארץ ישראל שתהא מוציאה גלוסקאות וכלי מילתין, שנאמר יהי פסת בר בארץ. ירעש כלבנון פריו ויציצו מעיר כעשב הארץ. ויציצו לשון ציצית. יהי שמו לעולם. שלא יטעום טעם מיתה. לפני שמש ינון שמו. שבעה דברים היו קודם שנברא העולם, כסא הכבוד, ושם משיח, ותורה, [וישראל, גן עדן וגיהנם, ותשובה, ובית המקדש]. כלו תפלות דוד בן ישי. וכי שאר לא היו תפלות דוד בן ישי, אלא כל אלו היה דוד מתפלל על שלמה בנו ועל מלך המשיח. דבר אחר כלו תפלות דוד בן ישי. חמודות, כדכתיב נכספה וגם כלתה נפשי (תהלים פד ג). 6. There will be hand sized corn in the land (Tehillim / Psalms 72:16). Rabbi Hiyya son of Asi said in the name of rabbi Johanan, the Land of Israel will bring forth handfuls of delicate breads and wool garments as well. Hence, it is said, There will be hand sized corn (pissat bar) in the land. The fruit will shake like Lebanon; and they of the city will flourish like grass of the earth (Tehillim / Psalms 72:16). They will flourish (uasisu), that is, they will flower with fringes (tzitzit). His name will endure forever (Tehillim / Psalms 72:17), that is, the king Messiah will never know the taste of death. Before the sun was, his name existed (Tehillim / Psalms 72:17). Seven things existed before the world was created, the throne of glory, the name of the Messiah, Torah, Israel, the Garden of Eden, Gehenna, repentance, and the Temple. The prayers of David son of Jesse are ended (kalu) (Tehillim / Psalms 72:20). And are not the remaining prayers also prayers of David the son of Jesse? Kalu, however, is to be read as kol’ellu, all of these, and hence, the verse means that all of these were the prayers David uttered concerning his son Solomon and concerning the king Messiah. In a different interpretation, of The prayers of David, the son of Jesse are ended, prayers is taken to mean the prayers of yearning, as is written, My soul yearns, yes, even pineth (Tehillim / Psalms 84:3). The rabbis open with a comment upon the abundance of God’s provision saying that there will be hand sized corn in the land with a reference to Tehillim / Psalms 72:16. The MT states, “May there be abundance of grain in the earth on top of the mountains; Its fruit will wave like the cedars of Lebanon; And may those from the city flourish like vegetation of the earth.” (NASB) The Lord will bring such a blessing upon the land and the people, the grain and fruit will grow in great amounts, to a gigantic size, and even the people who live in the city (Jerusalem) will flourish like vegetation. The interpretation of this is the people will take the grain and fruit and make wonderful breads. The further interpretation of the midrash states, “Hence, it is said, There will be hand sized corn (pissat bar) in the land. The fruit will shake like Lebanon; and they of the city will flourish like grass of the earth (Tehillim / Psalms 72:16). They will flourish (uasisu), that is, they will flower with fringes (tzitzit).” The rabbis are drawing in the mitzvot on the tzitzit and the Lord’s blessing of abundance in food and people. The midrash continues with comments upon the messiah and so the interpretation appears to be in relation to the messianic age. Yet was the fire of the Gehenna created on the eve of the Sabbath? Surely it was taught: Seven things were created before the world was created, and these are they: The Torah, repentance, the Garden of Eden, Gehenna, the Throne of Glory, the Temple, and the name of the Messiah. The Torah, for it is written, The Lord made me [sc. the Torah] as the beginning of his way.26 Repentance, for it is written, Before the mountains were brought forth, and it is written, Thou turnest man to contrition, and sayest, Repent, ye children of men.27 The Garden of Eden, as it is written, And the Lord planted a garden in Eden from aforetime.28 The Gehenna, for it is written, For Tophet [i.e., Gehenna] is ordered of old.29 The Throne of Glory and the Temple, for it is written, Thou throne of glory, on high from the beginning, Thou place of our sanctuary.30 The name of the Messiah, as it is written, His [sc. the Messiah’s] name shall endure for ever, and has exited before the sun!31 — I will tell you: only its cavity was created before the world was created, but its fire [was created] on the eve of the Sabbath. It is interesting to read the rabbis comments on the belief in the preexistence of the Messiah’s name. Some would say the belief in the preexistence of the name is another way to express the idea that the Messiah was prior to creation. This is very similar to what Paul taught in Ephesians 1:4 just as He chose us in Him before the foundation of the world, that we would be holy and blameless before Him. In love. (NASB) In the Apostolic Writings, the same view is expressed regarding the preexistence of persons and things. For example, when Yeshua said in John 8:58, “Before Abraham was, I am,” may have been a rabbinic allusion to the preexistence of the Messiah. In addition, Yeshua said something similar of the Kingdom of God, the reward for the righteous, was “prepared for you [the righteous] from the foundation of the world” (Matthew 25:34, compare the Mishnah Pirkei Avot 3:16, He would say: Everything is given as collateral, and a net is cast over all of life. The shop is open, and the shopkeeper grants credit, and the accounting ledger is open, and the hand writes, and everyone who wants to borrow can come and borrow, and the collectors go constantly on their daily rounds and exact payment from man – with or without consent, and they have that upon which to rely, and the judgement is true judgement, and everything is prepared for the feast. הוא היה אומר, הכל נתון בערבון, ומצודה פרוסה על כל החיים.החנות פתוחה, והחנוני מקיף, והפנקס פתוח, והיד כותבת, וכל הרוצה ללוות יבוא וילוה, והגבאים מחזירים תדיר בכל יום, ונפרעין מן האדם מדעתו ושלא מדעתו ויש להם על מה שיסמוכו, והדין דין אמת, והכל מתקן לסעודה.). Based upon Matthew 13:35 (“This was to fulfill what was spoken through the prophet: ‘I WILL OPEN MY MOUTH IN PARABLES; I WILL UTTER THINGS HIDDEN SINCE THE FOUNDATION OF THE WORLD’”), it appears the “hidden sayings of old” (Tehillim / Psalms 78:2) was understood to refer to Messianic secrets or truths prepared from the foundation of the world. Similarly the names of the righteous are “written in the book of life from the foundation of the world” according to Revelation 17:8 (“The beast that you saw was, and is not, and is about to come up out of the abyss and go to destruction. And those who dwell on the earth, whose name has not been written in the book of life from the foundation of the world, will wonder when they see the beast, that he was and is not and will come.” NASB). We also find the blood of the martyr prophets was also to have been “shed from the foundation of the world” (Luke 11:50) and consequentially, also, that of the “Lamb” of God (see Revelation 13:8 and Hebrews 9:26). The Apostles also claimed to have been, with their master Yeshua the Messiah, “chosen from the foundation of the world” (Ephesians 1:4, John 17:24, 1 Peter 1:20, and Hebrews 4:3). This idea that the name of the messiah existing from since the foundation of the world, or from before creation appears to be a very rabbinic concept. This idea includes the King Messiah’s existence before Creation, the existence of his name, and his existence after the creation of the world. There are two passages from the Tanach that favor the view of the preexistence of the Messiah, (i) Micah 5:1 that speaks of the Bethlehemite ruler, saying that his “goings forth have been from of old, from everlasting,” and (ii) Daniel 7:13 which speaks of “one like the Son of man,” who “came with the clouds of heaven, and came to the Ancient of days.” In the Messianic similitudes of the book of Enoch (37-71) these three preexistences are spoken of, (i) “The Messiah was chosen of God before the creation of the world, and he shall be before Him to eternity” (48:6), (ii) Before the sun and the signs of the zodiac were created, or ever the stars of heaven were formed his name was uttered in the presence of the Lord of Spirits (48:3), and (iii) general statements that the Messiah was hidden and preserved by God (62:67, 46:1-4), without any declaration as to when he came into existence. Thus, according to the Rabbis, the seven things fashioned before the creation of the world, included the name of the Messiah, and it is interesting to note that the Targum regards the preexistence of the Messiah’s name as implied in Micah 5:1, Zechariah 4:7, and Tehillim / Psalms 72:17. In addition to these things, the rabbinic literature (midrash) speaks of the “Spirit of God” which “moved upon the face of the waters” (Bereshit / Genesis 1:2) is the spirit of the Messiah (Midrash Rabbah Bereshit, Part 7, which reads alluding to Isaiah 11:2 saying, “The Messiah was born [created] when the world was made, although his existence had been contemplated before the Creation”). The preexistence of the Messiah in heaven and his high station there are often mentioned in the rabbinic literature as previously noted. The significant place the Messiah takes in Judaism is the reason Zacharias said what he did on the birth of his son in Luke 1:67-79. Zacharias doubted the Lord and was stricken not able to talk until his baby boy was born. On his birth his tongue was let loose and he spoke prophetically about the Messiah. Note how Zacharias says “with which the sunrise from on high will visit us (Luke 1:78). Does this not also sound like the opening to Midrash Tehillim 72, Part 4 on the Lord visiting in the morning? The King Messiah would be sent by the Lord God according to His mercy to bring salvation to His people. The Messiah would be the one who judges the poor and the people, the one who brings justice to all, the one who saves the needy, and breaks the hold of the oppressor, who brings with Him the Righteousness of God for salvation’s sake and to judge both the righteous and the unrighteous. The Apostolic Writings add that He brings with Him the wrath of God to those who do not know Him and do not want to have a part with Him and God’s Kingdom. (2 Thessalonians 1:7) The Rabbinic literature according to the Midrashim brings with it a rich understanding of what the Messiah will do, His place and role in the plan of God to draw not just Israel but all of the nations of this earth to the Lord God in heaven. This is achieved only by reason of the tender mercy of our God. Let’s Pray!